Reese's Book Club does it again! What a fabulous, though provoking, and honest story. Ask yourself. What would you do if your young child came to you and said they were somebody else? If your young boy wanted to wear dresses and makeup? If he asked you when he would grow up to a be a girl? Would you let her pursue her truth? What would you do if your child was bullied for her choice? Would you keep your child's gender identity secret for the sake of social acceptance, or would you let your child live freely without hiding? These are the questions you will ask yourself as you read This is How It Always Is. Laurie Frankel handles a sensitive topic with grace, and opens the reader's eye to the difficult choices some parents are faced with for the sake of their child's happiness. I am not a parent. I have never faced these challenges. But, I found myself asking myself how I would react if I were the parents in this book. And how I would feel if my child weren't happy in their skin. I cannot recommend this book enough. Regardless of your morals or beliefs, dealing with transgender children is real life for many families across the world, and this is a must read for everybody to gain some understanding and perspective. I don't care if you're liberal or conservative, a Democrat or a Republican. Everybody can learn something from this story. 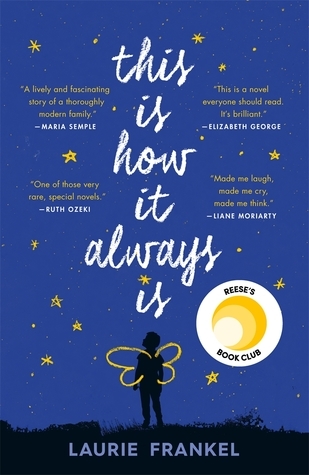 Sign into Goodreads to see if any of your friends have read This Is How It Always Is.